Which power adapters or cables should I use? How far can I run 12V outdoor security cameras? Can I extend power cords without voltage drop? Such questions about the 12V CCTV camera power supply and voltage tolerance can be quite overwhelming, indeed. With the practical buying and installation guide here, all of these won’t be that complicated. 12V security cameras are plugged-in surveillance equipment powered by 12V DC, which take a big market share for their budget-friendly prices and capacities to fit in both home and business usage. Some of you might concern that you won’t be able to run 12V outdoor security cameras with long power cables because of the potential voltage drop. That could be a big misunderstanding. In fact, statistics collected by security industry insiders shows that up to 90% of users set up IP security cameras around 100-130 feet. Meanwhile, the maximum distance for you to run 12V DC CCTV cameras without power drop is up to 300 feet – your security needs are covered perfectly. Even if you need to install 12V wireless security camera systems 300 feet away from your home, your hands are not tied. With multiple options of power extension cords for sale, you are able to purchase and add the matching cables to your outdoor security cameras as you wish and thus, run the 12V CCTV camera systems at longer distances. Further Reading: Click here to learn more about security camera power supply. Choosing the most suitable 12V security cameras for your home and small business isn’t exactly easy, given the wide array of choices available in the market. To help you out, we have collected 2 options that rank among 2019’s best 12V security cameras for your reference. If you are looking for a single 12V CCTV camera or plan to add some IP cameras to your 12V security camera systems, Reolink RLC-410 is definitely worth your investment. With sharp images and excellent night vision, this 12V PoE IP camera allows you to keep tabs on your home and business days and nights. The CCTV footage below is recorded by this 12V outdoor security camera, showing that 2 suspected fuel thieves failed to steal fuel from a truck and escaped. 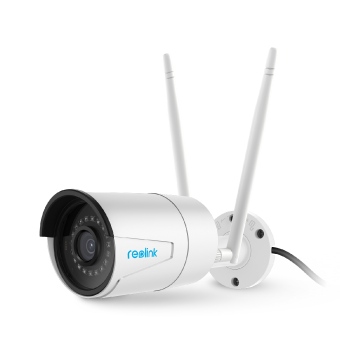 Note: If you plan to avoid PoE configuration and prefer a 12V wireless security camera, take a look at Reolink RLC-410W, a WiFi version of RLC-410. For bigger houses and small business with warehouses, 12V security camera systems like Reolink RLK8-410B4 are perfect security solutions. Such systems will cover multiple entrances and offer you around-the-clock recording with the standalone NVRs that support up to 8 PoE IP cameras. Below is a video sample of the RLK8-410B4 12V security camera system, which shows that a man wandering in the street, tried to break into someone’s house but failed. 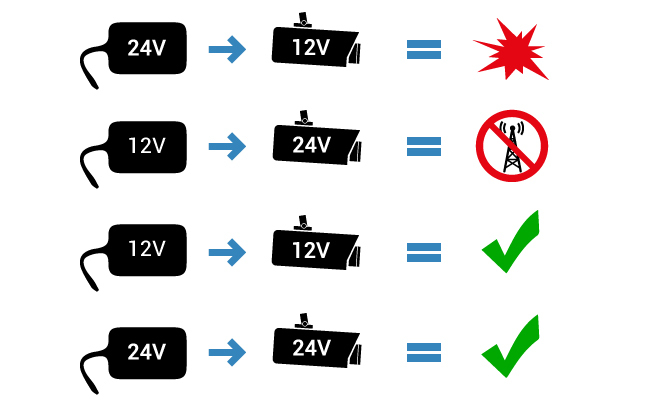 When buying 12V security cameras, do not focus on the power supply specifications only. Buying no-name cheap 12V DV CCTV cameras doesn’t mean that you are saving money. It is likely that you’ll spend extra money on the camera accessories (like power adapters) and the repair once the camera goes wrong, with a total cost even higher than buying brand name 12 voltage IP cameras. #1. Power adapters are included in most brand name 12V security camera kits. With matching power adapters of your 12V CCTV cameras, you won’t have to pay extra for power adapters or waste time to consult the professionals on which one to buy. #2. Such 12V CCTV cameras can withstand voltage changes. Inferior and cheap 12V security cameras may fry even when they are connected to regulated 12V power adapters. With 12V wireless CCTV cameras from reliable security camera brands, you are free of such disasters. That is because such security cameras come with certain voltage tolerance, which allows them to work and withstand slight power fluctuations without damaging their units. #3. Reliable security brands offer you a long warranty & responsive support. In addition to qualified 12V outdoor security cameras, top security camera brands will also provide their users with a long period of warranty and customer service. When you encounter any 12V security cameras power supply problems, just feel free to contact the support team and ask them for further assistance without costing a dime. Instead of scrolling to the end of 12V security camera listings aimlessly, firstly figure out whether you would like to go for a 12V WiFi security camera or a PoE one. Takeaway: Click here to learn how to run the 12V security camera power wires and network cables in a breeze! When you plan to install 12-volt CCTV cameras outdoors, it is best to take a look at the IP ratings before making a purchase. 12V security cameras with IP65+ are able to withstand heavy rain and other weather conditions. To ensure their performance for a long time, you’d better install 12V waterproof security cameras under the eaves or other shelters. What are the other factors that you may consider when buying 12V security cameras? Share your ideas in the comment section and we would like to hear! To ensure the best performance and long life of 12V security camera systems, take the following tips into account when you are doing the installation work. If 12V CCTV cameras are working under unsuitable voltage, picture problems like the “rolling lines” on the screen and blurry night vision may emerge and the risk that your security cameras get fried will increase to a large extent. Generally speaking, most 12V security cameras come with an input voltage tolerance like -/+ 5% that allows you to power the CCTV cameras within upper and lower tolerances. This can be very helpful especially when you need to run long power cables. By increasing the input power voltage, you are able to make sure that your 12V IP cameras work perfectly without being affected by voltage drop. Before you use higher power supply voltage, remember to confirm the maximum and minimum voltage allowed for your 12V outdoor security cameras. Also note that by applying the power adapters and extension cables recommended by security camera brands, you are able to avoid frying your CCTV cameras. In terms of adding power converters and other power supply accessories to 12V wireless security camera systems, we only recommended homeowners who are with professional knowledge or with technicians’ assistance to do so. To prevent power drop and data loss, it is best for you to set up 12V DC security cameras within the recommended range. Take Reolink’s 12V PoE IP camera systems as examples, you are free of power drop problems by installing the systems within a range of 300 feet. Supposed that you require a power lead extension to run 12V security cameras far away from your base, just add power extension cables to the CCTV cameras. Or, if you are looking for other solutions that won’t be confined to a certain cable range, battery-powered security cameras will be your ideal choices. Such outdoor IP cameras deploy battery or solar energy as their power supply, which allow you to place them anywhere without the limitations of cables and power outlets. Quite flexible and portable. Heavy rain and other harsh weather conditions may damage your 12V security cameras, wires and the power outlets as well. A junction box may help reduce such damages. Take a look at the genius work by this Youtuber who adds a junction box to his 12V dome security camera. And it looks nice with all the cables tidied up! Further Reading: Click here to learn about the best places to install 12V outdoor security cameras. This entry was posted in Buyer's Guide and tagged 12V DC, 12v security camera power adapter, 12v security camera power supply, security camera power extension cables, security camera voltage tolerance.